SO THIS CALLS FOR A LIST! 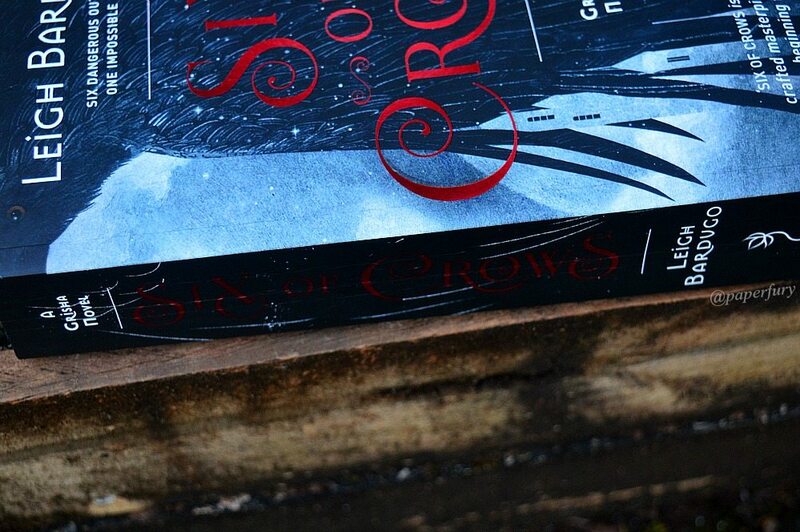 6 Things about Six of Crows, obviously, because six. It puts the EPIC in “epic fantasy”. No doubt. No question. ONLY SCREECHING. It’s basically a heist book, set in a Russian-inspired fantasy world, where a crew of thieves go after The Ultimate Big Haul to become rich as kings or queens respectively. They’re dark and dastardly fiends. And when I say “dark” I mean SUPER DARK. Their backstories are heartbreaking and there’s torture, slicing, bleeding and dying. Also magic. ALSO CAKE. • KAZ: He’s the coldhearted mastermind and yet somehow so tragically wonderful?! He cheats death and he’s endlessly clever. And he has a limp. • INJE: She’s the “spider”, acrobat, and hears and sees everything. I be shipping her with above very very aggressively. • NINA: She’s a Grisha (magician, basically)! She’s also sassy and capable and epic. • MATTHIAS: He is like a bulldozer and hates everything. Meh to him. • JESPER: The dorky comic relief and likes to shoot everything copiously. • WAYLAN: He’s the filler character who’s name I forgot the second I read it but he was little and defiant and still cute. I loved the characters…they are dimensional and interesting and I loved and hated them all at once. I particularly love Kaz because — HELLO MASTERMIND. I also have a decided weakness for clever, tortured and despicable characters. #sorrynotsorry Matthias I did not like becuase he has a self-righteous vibe going and it just annoyed me. And the book is super long. Too long? If we’d had less backstory that would’ve kept the pace chuffing along faster. I loved reading it, but when I put it down I had a severe sense of exhaustion. I crave conciseness. Buuut, HEISTS AND WORLD BUILDING AND HUMOUR AND HEISTS. Did I mention heists?! I LOVE HEISTS. Show me Ocean’s Eleven, The Italian Job, or Leverage and I shall prattle on for HOURS. (Though, I assure you, I personally do not steal. I mean, I stole chocolate from the fridge once? So that was pretty evil since it wasn’t strictly mine.) And the heist is complicated and the plans are awesome. Plus stuff continually goes wrong and the characters aren’t spared and the world-building is complex and blood everywhere and YESSSS. I LIKE THIS. Did I mention cons and manipulation?!! I loved it. But it lacked tightness for me. I wanted less of EVERYTHING and more intensely a few things. Also please no to that nail-biting ending. I need the sequel now. I NEEDED THE SEQUEL YESTERDAY. I’m entirely sure Six of Crows is the kind of book I will hug and then murder softly with a small 50ft pole because it hurt my feels but I love it. Definitely a new favourite fantasy!! THE DEAL IS THE DEAL. THANK YOU TO HACHETTE AUSTRALIA FOR THE REVIEW-COPY! 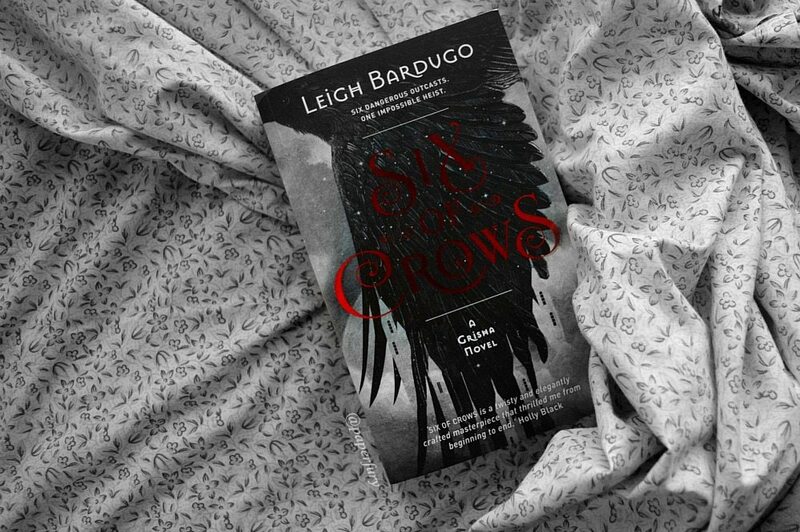 Six of Crows (book #1) by Leigh Bardugo was published October, 2015.
are YOU a fan of heists and cons?!? 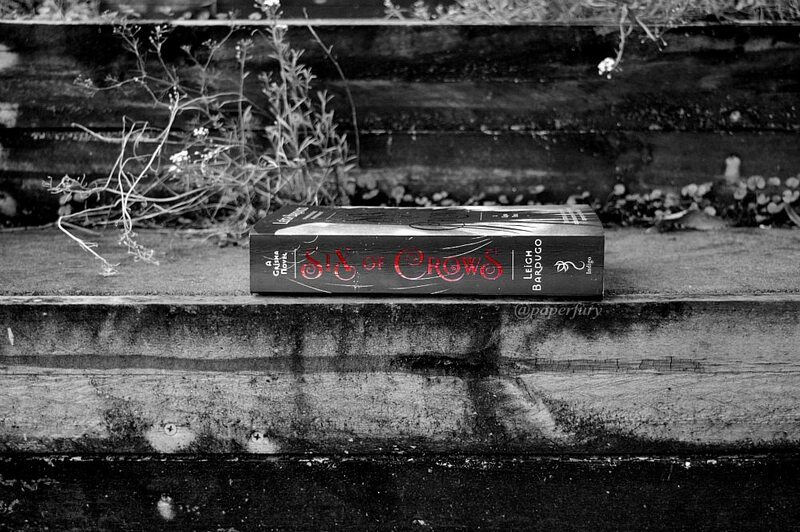 have you read Six of Crows yet? (because you should.) THOUGHTS?!? and how DARK do you like your YA books?!? what’s the darkest YA you’ve read in the past?? I only heard wonderful things about this. I’m definitely NOT reading the Grisha first if this one centers around evil masterminds, come on. How am I going to pass this up? Thank you for a new suggested read, definitely buying this. I tried reading this one, and I just.. I couldn’t get into it. Plus I’m not a huge fan of anything more than three characters (I’m a wimp, I know). I don’t have a whole lot to say about it other than the fact that I haven’t even read the Grisha series yet. I plan to, and maybe I’ll retry Six of Crows too. We’ll just have to see, Kaz sounds really wicked though! Telling me something is dark is like offering me free candyfloss for reading it. I’ve seen nothing but stellar reviews for this one, so I want to get round to it eventually. Haha!! Goes to show how we all interpret books differently, right?!!? 😛 I’m glad you enjoyed all the POVs and backstories!! I did love the details, I just wanted to see more details on fewer things. *sighs* But I am definitely a picky berry. XD And it was definitely a solid 4! If not 4.5! GUUUUUURL, so not fair! You make me want to leave everything behind and read this book right now buuuut I have a big exam on Monday!! Life is very unfair, I tell you. This is already sitting in my ereader and I can’t start it. 🙁 Hopefully, I will soon! Aah, I am getting crazy excited for this book! I haven’t read any of Leigh Bardugo’s books so when I first heard about Six of Crows I was a bit like, meh, (which is stupid because assassins and thieves!) but I’ve just reserved it from the library and can’t wait for it to arrive!! I usually don’t like books with multiple narrators just because it tends to slow me down but oh well, Six of Crows seems freaking epic 😀 Awesome review, Cait! Omg only a duology?! *cries* I could read a TON of books about these characters. THIS SOUNDS FANTASTIC AND I AM GOING TO GET IT. Sometime. Maybe. I know you said I don’t have to read the Grisha trilogy, but what if I did’t LIKE it? But there’s cake! I actually haven’t read very dark YA, because I go to adult for the darkest stuff, but Unwind (MG?) was pretty creepy. YOU WOULD REALLY LIKE IT. I just have this feeling. *nods* I felt like Unwind was YA, since they were like in their teens, right?! AND IT WAS CREEPY. I had nightmares from that. xD that shark…arm….omg. Oh my gosh, yes- I adored this one too. I read it last month while I was on a school trip. I liked reading all the point of views- but I’m with you- they didn’t really develop- all the development was in the backstory, so that was how we saw them change. I actually adored Wylan, and it was a really interesting choice that he didn’t get a perspective. Nina and Inej are my faves. Heists and cons are fabulous, I love seeing the plot unfold (shout out to the heist society books by ally carter, which were so great) I quite like darer YA, though I can’t stand dark movies. Fairest by Marissa Meyer was pretty dark, as was Speak and Wintergirls by Laurie Halse Anderson. Thanks for the review! OOH yes. You worded that so perfectly. *nods* Like Nina changed a lot, I think, in her actions and decisions, but mostly everyone else was just backstory focused. :O I loved ALL the characters (apart from Matthias haha) but I don’t think they all needed POVs. Maybe just Kaz, Inej and Nina? Eep. YES LET’S TAKE A MOMENT. A GOOD LONG MOMENT BECAUSE AFJDKLAFDJS KAAAAZ And I’m totally going to go read your review immediately. Squeee!! 😀 I did love the backstories! I just…for me it was too much and too intense. Like I wish some stuff had been held back for future “Ooh, but I want answers” sort of feel? Instead I feel like we got everything very fast. This is my next read and reading your review has me so damn excited Cait!! I love heist, and magic and evillery (which of course is a word, anyone who says otherwise knows nothing [John Snow]). I really love multiple POV books, I love experiencing the story from so many angles so maybe I’ll enjoy that element more then you seems to. The Grisha world is so magical and brilliant and I can wait to dive into it again!! GOOD. MY WORK HERE IS DONE. hehe. Evillery is basically going to be in the dictionary next year, just you wait and see. I have this knowledge of things. Omg yes I saw the posters!!! But I kind of new before hand, it popped up on my fb aggeess ago that Kit Harrison had been spotted in Belfast (I have no idea how to spell that) when they were filming the upcoming season. I just started Six of Crows and I’m really enjoying it so far! I AM TORN, CAIT. I despise too many narrators, but HEISTS. RUSSIAN INSPIRED EPIC WORLD. MAGIC. How could I resist??? I hope it’s good! I’m weird with darker books, because I love dark backstories and when there are actually consequences, but I don’t like it when the TONE of the book is too bleak if that makes sense? I also like antiheroes, but TBH I also want the characters to be somewhat redeemable at least? How to Lead a Life of Crime was pretty good, and The Darkest Minds has some dark moments. SQUEEEEEEE. I HOPE YOU LIKE IT. I cannot hug this one enough, tbh, and the sequel!! *flies about and wails* I NEEDS IT. So… I haven’t read this book. Please refrain from killing me. I really loved the Grisha trilogy, though, and I can’t wait to get hold of this. I mean, I might just buy it for the cover and then stare at it for days on end. SO MUCH BEAUTIFULNESS. Of COURSE I won’t kill you!! It’s new, come now. 😛 And I will fully support buying-it-for-the-cover-and-staring-at-it because that is a wise life decision. NO REGRETS. yES YOU DO. I feel like this will be one where you’ll adopt all the tragic tortured characters and adore them. I’m actually reading this book right now. I love it so far, and mostly because of Kaz. You can have Kaz. I’ll take Jesper. GREAT. WE SHALL DO THAT. *takes Kaz and runs away with him* DEAL IS THE DEAL HERE. I LOVE heists and cons. I thoroughly enjoyed the Grisha series. I drooled over Six of Crows’ black pages. This should have been my favorite book of the year! But it wasn’t. At all. The very end managed to catch my interest and bump it up to 3 stars, but I had to force myself through the first 90 percent. For some reason it didn’t work for me at all. There were way too many POVS (and they were still being introduced, over 100 pages in, ugh), I didn’t really care about any of the characters, I was bored, I had no idea what was going on most of the time…basically it was a mess. I’m still disappointed in myself. Is Red Rising considered YA? That’s probably the darkest one I’ve read this year. Exactly! What about Zuzana, only the best secondary character ever?! Or Zuri. Basically Laini Taylor writes the best secondary characters ever. Besides JKR, of course. Erm, I still haven’t decided what I think about Red Rising. I think I need to read it again. yES EXACTLY. And I would also like to take a moment for Despina from The Wrath and the Dawn, because she owned that boo, omg. Just wanted to add (because amid all my fangirling I forgot to mention it) that yes, I would have loved to read more of Kaz’s POV. At the end of each chapter I was all excited like NOW ARE WE GOING TO READ MORE INTO THE LIFE OF THE CRIMINAL MASTERMIND??? Oh okay, another Jepser chapter. That’s fine, I can deal with it. However, I actually really enjoyed the whole backstory part??? I loved how intricate everything is. Yeses? Yesness?! LET’S GO WITH YESNESS BECAUSE IT’S FUN TO SAY. *nods sagely* AHHH I’m so glad you loved it too!! I need more fantastical heist books in my life, tbh. They shouldn’t be so far and few! THEY ARE AWESOME. And don’t worry, your comment makes PERFECT sense. So many dfkjsa2wqtqtqqqqq feels. I saw “Six of Crows” in the post title and instantly lost my mind. I am also aggressively shipping Kaz and Inej, but also Matthias and Nina, which is probably why I was fine with hearing so much of their backstory. The romance was EVERYWHERE so I pretty much floated on a cloud of happiness the whole time. And there were no love triangles everyone just fit together the way they should!! I absolutely understand the feeling that we didn’t need every character’s perspective. Often I would be all excited reading about Kaz and then it would jump to Jesper and I’d have to stop myself from screaming in rage. But I guess that’s to make sure that everyone’s fav character gets their air time. But I agree, more Kaz next time, all Kaz next time. Okay maybe not all Kaz, but mostly Kaz. I disagree about the book being too long, but that’s just because I wanted to read more :p Great post as always! I agree!!! I liked Jesper just fine, but I’m not sure we needed his POV…>_> KAAAAAZ. Omg. And Inje. I particularly loved her POV too. Basically I’m very very excited. I LOVE KAZ HE IS THE BEST. “coldhearted mastermind and yet somehow so tragically wonderful” yesh, all of the yes. BUT HEISTS AND I CAN'T WAIT FOR THE MAIN HEIST PART TO START AND THE FACT THAT YOU LIKED IT MAKES ME SUPER EXTRA EXCITED. OMG I SPELT INJE WRONG!!??? Gah. *facepalm* I feel like I can’t remember if it was Wayland or Wyland either. 0_0 So bascically Kaz’s name is all I’m sure of here. XD hehe. But squeee!! I’m glad you liked the review. I do know what you mean *nods* And I like seeing Kaz from other’s POV’s. But I still reckon 3 POV’s could’ve covered everything quite nicely instead of like 5 or 6 or whatever it is. *dies a little* OMG DID YOU GET TO THE EYEBALL SCENE??!?!? EEEE I can’t wait to read this book! It is EVER SO HIGH on my list (but Winter is higher and actually in my possession right now so it gets priority). As you well know I ADORE anything with Slavic vibes so GAH SO EXCITED! And yes! Heists! I actually didn’t realize how much I love them until I thought about it – but I DO love heists. Oooh, yay for your novel then! 😀 I AM ONBOARD. I wrote and entire novel specifically so I could steal things. XD Actually I was screaming when I heard about Six of Crows at first, because my book is Russian fantasy + heists. GAH. XD But whatever. I told myself I’m not allowed to read this one until I finish the Grisha trilogy – specifically, Ruin & Rising. I don’t even know why I put it off in the first place, because I loved the first two books, but now its been so long I think I’ve forgotten most of what happens. Gah. Books with multiple perspectives can be tricky to get right – there’s always the issue of making the voices distinct, and providing a balance between too much and too little information. Sounds like Six of Crows struggled a bit with that, but the action and the heist seem to make up for it! Can’t wait to finally read it! OMG OMG DELAY NO LONGER HANNAH! EMBRACE THE GRISHA! (Actually I was disappointed with Ruin and Rising, but it was still well written. XD Siege and Storm will forever be my favourite. <3 STURMHOND.) I think Six of Crows does well with the distinct voices! I just think I struggled to attach myself to SO MANY people all at once. Like the story was great, but if there had been less perspectives it would've been so so much tigher. Okay, that was only semi-relevant. . . Throw the blurb out the window, you had me at copious characters, and dark scariness that delivers! And humor. Must have my laughs. I think I have to read this. And I *usually* like copious narrators if the author does it right. Sooo. . . Yeah. You’ve convinced me. The super longness is the only thing that daunts me. I might be reading it forever. Epic fantasy always makes things better. I vote that we rewrite all the stories into an epic fantasy setting. Ah! I looove the masterminds, especially if they are clever AND funny. i. e. Jaron from the Ascendance Trilogy. IT IS ENTIRELY RELEVANT. *takes a moment to fangirl exclusively because Eliot* AHEM. So yes. I do so love dark humour too, and cake. I was very very happy at the cake quips in this book. All books need cake, tbh. I think you’d enjoy this one a lot then! 😀 I’ve always been a bit iffy about tons of characters (although Game of Thrones has helped a bit…since some books have like TEN narrators or more…omg. 0_0). I vote that we go with your vote because epic fantasy is life. Also death. BUT LIFE. I want to read this book with all of my heart, but I told myself I have to read the Grisha Trilogy first…. It’s a painful thing to do, especially since I don’t even own the first book yet. But it must be done. I know I don’t have too, but I want to! I really do love dark books, so yay for that! I haven’t read the original trilogy and I really do want too, so I think I”ll wait and get to those before I start this one (even if you don’t HAVE to per se). Sorry there was a bit too many characters and stories going on, but yay for loving it still. YAYYYYYYY. I also feel like this book needed more Kaz, but I didn’t mind all the other perspectives. AND WYLAN (WAYLAN?) WAS SUCH A SQUISH. I want to squish him. I don’t think we got a perspective from him, now that I think about him. Oh, nope. I’ve been looking at this book for quite some time now. I almost bought it just because THAT DESIGN. Oh my word. The black pages? So cool. And I love the texture of the cover. I have Shadow & Bone, so I’m planning on reading that first before I buy this, that way I know whether or not I like the author’s writing and such. This really has me even more curious about Six of Crows! Alise is yelling ALL THE GOOD THINGS THEN. Trust Alise, Bec. TRUST HER AND ME AND READ THIS THE SECOND YOU GET IT FOR YOUR BIRTHDAY. WHYYY AM I NOT SURPRISED?!?! heheh. But yes! It took me a while to kind of get everyone sorted. :O Not that they all sounded the same (they all sounded so so different, which was amazing writing!) but just there was SO MUCH DETAIL and SO MUCH BACKSTORY. *brain smushes* It felt like it could’ve been so much tighter…. I don’t even know why I am so keen on reading six of crows. I don’t really like heists. 🙂 But dark and scary… that gets me going! The first Grisha book didn’t actually impress me a lot either! 😛 MY BAD, TOO, THEN. XD But the second book is everything, and the third book is good but my ship sunk so I ended up super mad. hhaaha. *collapses in tears* BUT STILL. Evillery is a word that everyone should use, tbh. I’m looking forward to reading this one so much! All of the characters sound like they’re developed super well, even though sometimes it got a bit much and a bit too long. I can’t wait to read this one, thanks for the review Cait! A good and honest review. I have been hanging out for this book as I enjoyed the Grisha trilogy and like you said a Heist Fantasy book, just take my money now. I hope to enjoy it as much as you did but hope really hope the 6 different points of views don’t annoy me to much (I also hate multiple points of view for the sake of it). Ohhhh yay, I am dancing around because someone agrees with me! I feel exactly the same way about all these things! It took me SO LONG to read, because yes- you are so right, exhausting is the perfect word! Sometimes I was like “enough!” (I need that Rebel Wilson gif, stat!) because I just couldn’t take any more. BUT I liked it! The characters were amazing. But sometimes I felt like things were too “neat”. Yes, their backstory was awful but… there were conveniences that irked me. Still, like you, I absolutely need the next book. I am just glad I am not the only person who had issues with it! I have Six of Crows resting patiently on my TBR shelf, waiting to be read. I can’t wait to finally pick it up! I’m a bit bummed about 6 POVs but I am still excited to dig into this beautiful book. Ughhhhhh I’m not enjoying this one too much 🙁 I don’t know if it’s a reading slump but I read the first sixty pages TWICE and still started skimming things. Which is so weird. Hopefully it gets better towards the end??? There are a LOT of povs, haha. OOOH NO YOU BREAK MY HEART, EMILY. *wails* Although I confess, the beginning is the most confusing. It started to become a favourite for me after the first 100-pages? Awesome review! I really hate the “too many POV’s” thing. Sometimes authors just go overboard with telling me what every single person in the book is thinking. I don’t need it all. But it sounds like this is a great book despite that. I will be adding it to my TBR. Thanks for adding to my pile yet again. You are evil! The book is dark! Yes! No one told me that. After Ruin & Rising, I’m super excited to hear that. Of course, I’m a Slytherin, so I’m already on the dark side. *eats a cookie* Can I tell you that I am amazed you found a book that talks about cake like you talk about cake? I have heard that issue about the length, and about it being slow for the first 100 or so pages. Which I think is part of the reason I delayed reading it for so long. But everyone seems to have given it a 4 or 5 regardless of this, so I think it’ll be one of my December books I read. Great review! I AM SLYTHERIN TOOOOOO. *joins you on the dark side with darker cookies* I do hope you enjoy it when you read it. 😉 I think once I got a hang of who everyone was, the pace got faster and I kept up with the plot more. *nods* IT IS INTENSE. AND GLORIOUS. 😀 IT WAS LIKE THE FIRST HALF OF LEVERAGE, NO? 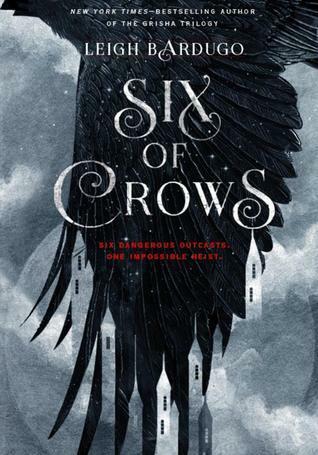 I really liked Six of Crows for many of the same reasons as you, although the number of characters didn’t bother me much, because I believe there were more than six. Like, that random guard dude who was killed in the first chapter. And since I like books like Unwind that didn’t bother me. I didn’t like Matthias either, though. I did not fall in love with his moral dilemma, which is a bad sign, because usually I am a big fan of moral dilemmas, especially when they make the wrong choices. Matthias just ticked me off constantly. GAH. And I’m definitely excited for the sequel too! BRING. It. ON. Commenting so late because I wanted to wait until after I read it, and I agree with so much of this! The writing definitely didn’t feel as tight to me as Bardugo’s previous books and the pacing was very strange to me as well. And more Kaz, yes! I am never into “bad boys,” and well, I’m still not into Kaz *that* way, but he was definitely the most interesting character. He had so many different facets and I want to know so much more about him! (And yes, him + Inej!) I’m hoping the next book will have a little less backstory, and maybe that will help! Even your complaints of this book make me want to read it. xD I’m pretty sure I’d enjoy the numerous characters and backstory and relaxed pace, BUT we shall see what I think when I read it! I absolutely LOVED this book. I enjoyed this one more than you. I just really loved all the characters, they were just such a crazy bunch. I adored Kaz because he acted so cold hearted and like he cared for no one. But it was so obvious he really did have feelings and he was rather terrible at times when it came to hiding them. He cares for Inej, but he’s just too chicken to admit it. I found that all so adorable. I can’t wait for the sequel. It’s only going to be a duology so I am excited to see how it all ends. I do love how tough and callous Kaz is…but in reality he’s too SCARED TO ADMIT HE LIKES INEJ. Oh adorable messed up little darling. *feeds him cookies of the dark side* SEQUEL = NEED IT NOW TOO. P.S. I ship Inej and Kaz toooooo!